Home » General Health » Does Your Doctor Talk Too Much? It Could Be Harmful! Does Your Doctor Talk Too Much? It Could Be Harmful! Is your doctor easily distracted? Overly chatty? Gets sidetracked from the issue at hand? An interesting bit of research shows that many doctors waste patient time and lose focus by talking about irrelevant details. The bit of health news is really about what’s best for patients. By recording conversations in clinics in Rochester, NY, researchers found that many doctors talk about themselves—often interrupting a patient. Irrelevant information leads to a loss of focus. The study was intended to show how patients were cared for. For that, 100 family physicians allowed two researchers to visit their clinics, unbeknownst to them. The “test patients” had a tape recorder rolling to document the visit. Sometimes the doctor found out it was a test patient, but in 113 cases it was successfully kept a secret. The researchers were surprised to find out that, in one-third of those recordings, doctors talked at length about themselves. It was strange because none of what they talked about was of help to patients. It also didn’t seem to help solidify a doctor-patient relationship. It was just…talking. And, in most cases, the doctors never returned to their personal anecdote later, meaning it truly was just a time-waster. Perhaps doctors tried to assure patients by saying things such as, “I understand, I had those symptoms too once;” that would be one thing. But this simply wasn’t the case. Doctors weren’t comforting their patients. Instead, what the patient was saying got lost: 80% of the time when doctors talked about themselves, they never returned to what the patient had been saying. These results are odd, because, in a doctor’s office, the entire focus needs to be on the patient. That’s how proper diagnoses are made, the right medications are prescribed, and the right medical advice is given. If doctors go off topic into irrelevant personal details, it not only wastes time, but also might make them miss an important detail the patient verbalized. Doctors want to connect with the patient, and that is important. But talking about themselves served no useful purpose, according to the study. 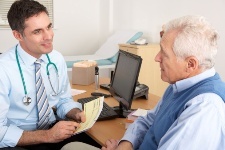 When you see your doctor, be sure not to allow the conversation to get too off track. Be sure not to leave until each of your questions has been addressed. Otherwise, why did you go in the first place?